Below you can find driving directions from Google Maps to help you get from Miami Gardens to your nearest Fix Apple Now store, situated in Hallandale. You can either copy the driving instructions below or click here for a larger map and driving directions. We can help if you're experiencing a problem with your iPhone 4,5 or 6, iPad, iMac, MacBook Air or Pro or iPod in Miami Gardens. At Fix Apple Now, we have an excellent track record when it comes to fixing Apple devices and getting right to the root of the problem so it doesn't resurface. Whether you need your device fixed, repaired, restored, changed, mended or reset, we can help. We offer some of the best prices for Apple repairs in the area and you can get in touch with us at any time if you have any queries about the various valuable services that we have to offer. Talk to us today if you need help with a red screen, unresponsive touchscreen, random crashing, boot loops, cracked screen or frozen camera. You can count on us to deliver a quick, high-quality solution at the right price. 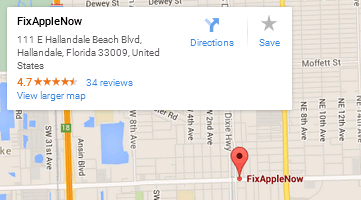 We are here for you if you need to fix your Apple device in Miami Gardens.